Imagine a destination as grand and storied as the "Isle of Enchantment" itself, nestled in the heart of Old San Juan Puerto Rico just steps from historic landmarks and nightlife. 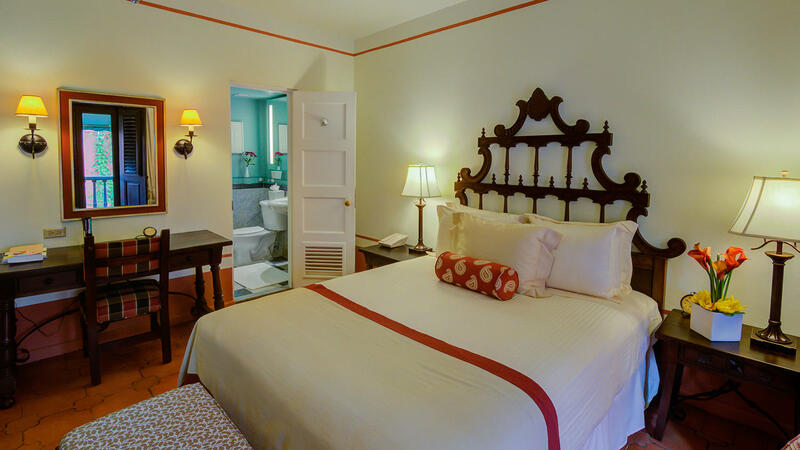 Old world charm and elegance meet contemporary comfort and luxury at the Hotel El Convento, which was built in 1646, was the first Small Luxury Hotel of the World Member in Puerto Rico and is the oldest member of the Historic Hotels of America. As our guest, you will enjoy a range of comforts and amenities, including access to our Beach Club, fitness center, pool and a nightly complimentary wine and hors d'oeuvres reception. Experience our award-winning hotel and learn why our guests consistently rate us among the top hotels in San Juan on Tripadvisor. 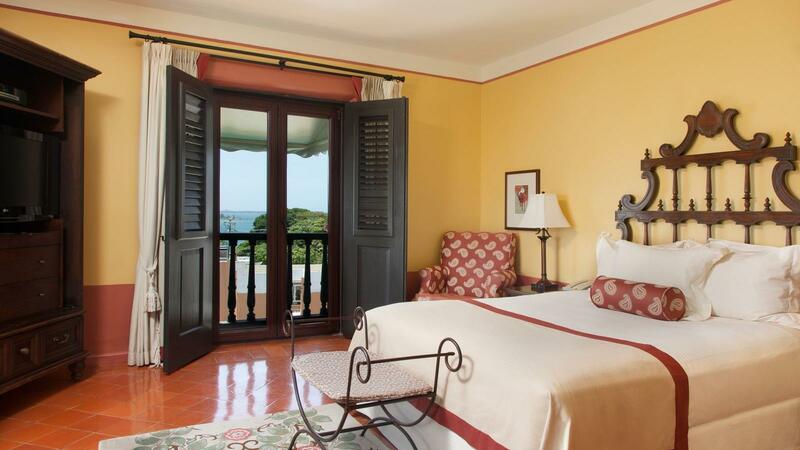 These guestrooms provide one Queen bed, beautiful Spanish furniture and Louver Doors that open to a Juliet balcony overlooking the magnificent San Juan Bay. Very romantic! 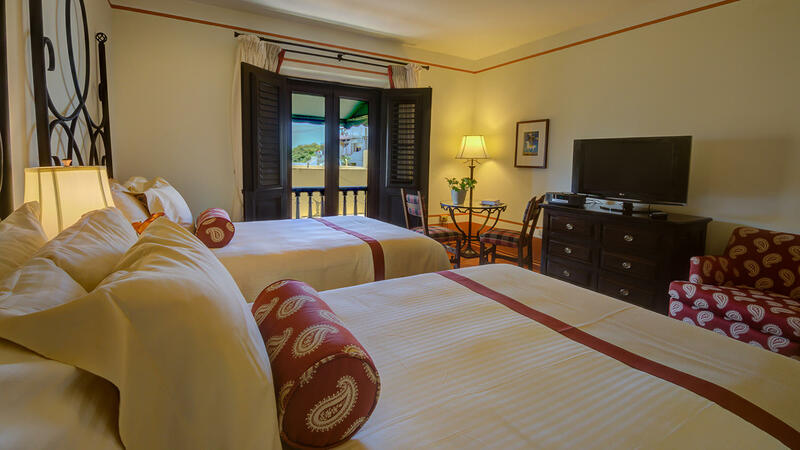 A luxurious Suite with King size bed, Queen size bed or two double size beds and a full sofa bed. Delightful accommodations with a Queen bed, beautiful Spanish furniture and Louver Doors that open to a Juliet balcony with limited view. Elegant and spacious high ceiling, one Queen bed accommodation that combines beautiful Spanish furniture with a comfortable private terrace to enjoy natural sunlight. 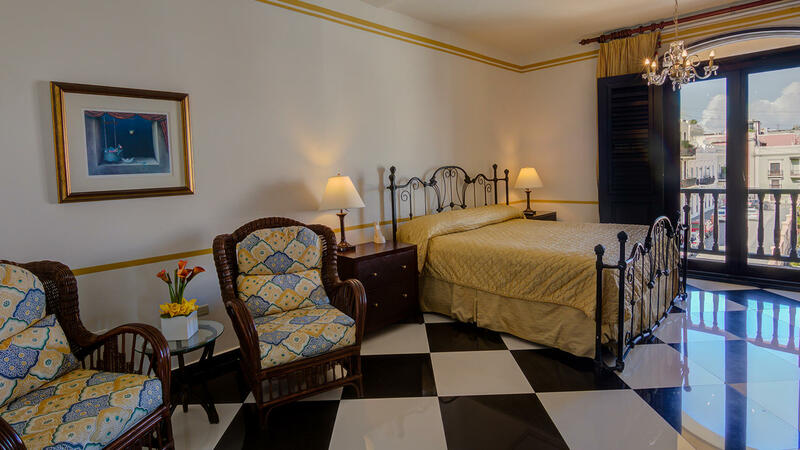 Refined accommodations with two Full size beds, beautiful Spanish Furniture and Louver Doors that open to a Juliet balcony with a colorful view of the San Juan Cathedral, and the bustling town square. 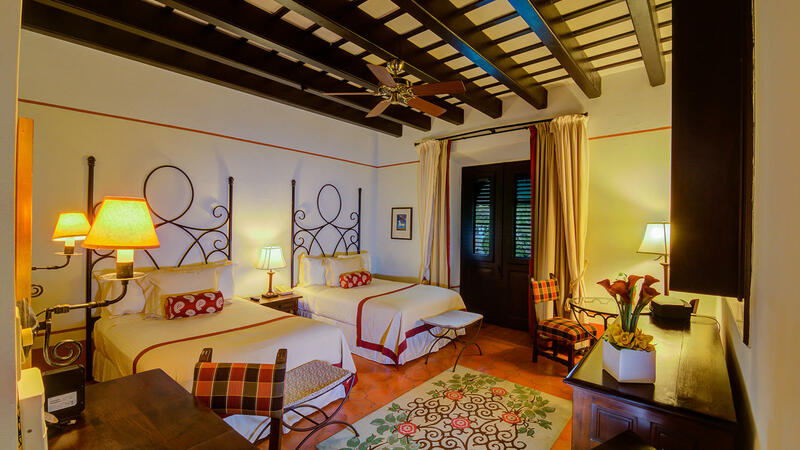 Elegant accommodations with a Queen Bed, beautiful Spanish furniture and Spanish Louver doors that open to a Juliet balcony partially overlooking the historic city. 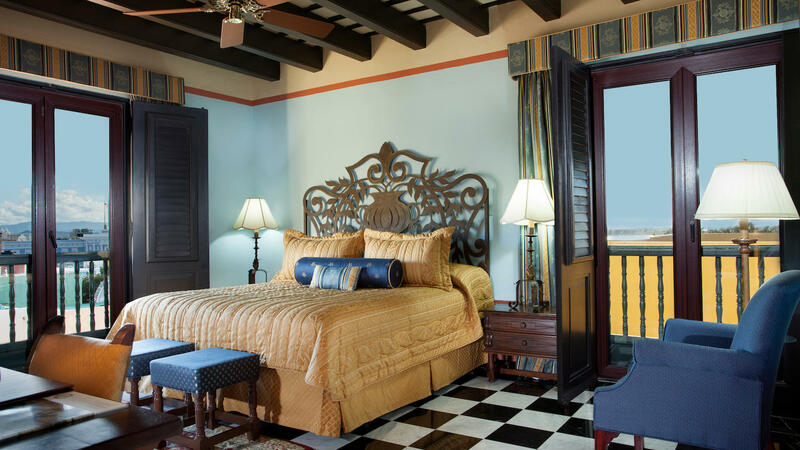 These two full beds guestrooms provide high ceilings with mahogany beams, beautiful Spanish furniture and Louver Doors that open to a Juliet balcony partially overlooking the Historic City. One Bedroom Suite with a King size bed in the Master Bedroom and a Full size sofa bed in the parlor, Spanish Louver doors that open to a Juliet balcony overlooking the Cathedral, antique marble floors, and beautiful decorations. Perfect for honeymooners! 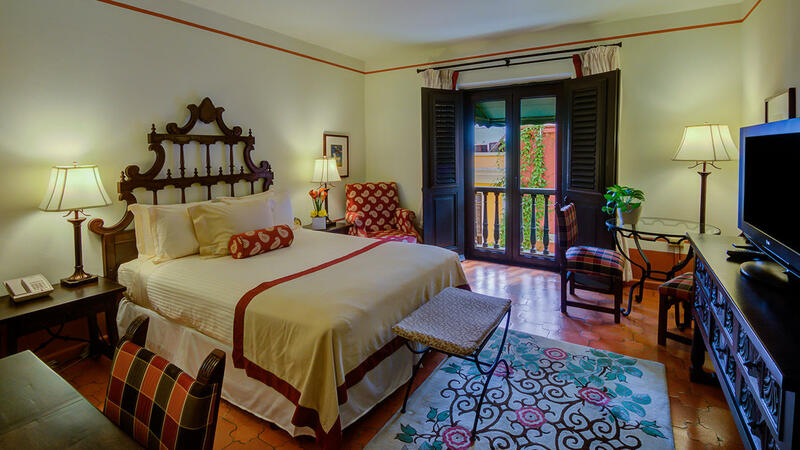 Luxurious Master Suite with a King Size bed, magnificent marble bathroom with Jacuzzi, Trompe-l'œil walls, and two sets of Spanish louver doors that open to a Juliet balcony overlooking "Plaza de las Monjas" and our historic city. 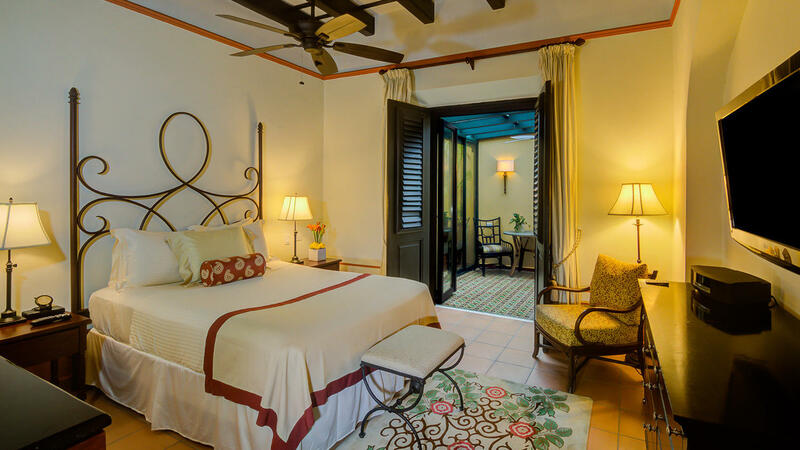 Do not let your winter last forever, swing back into spring at Hotel El Convento. 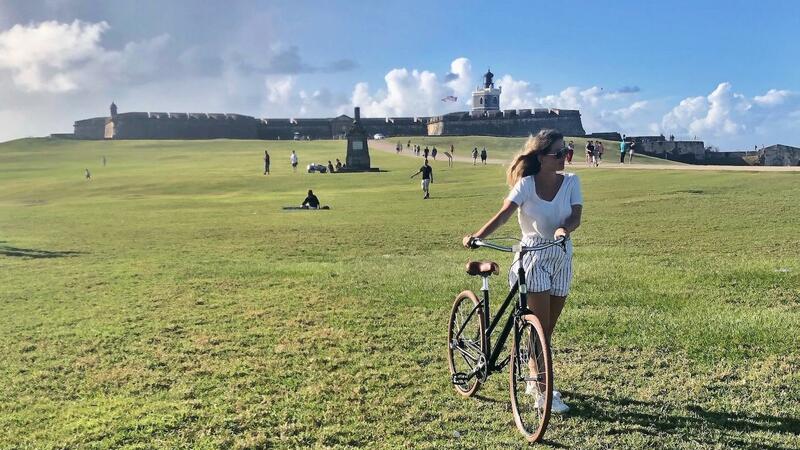 Discover the history of Old San Juan with a visit to Castle San Felipe del Morro and San Cristóbal included with this package. 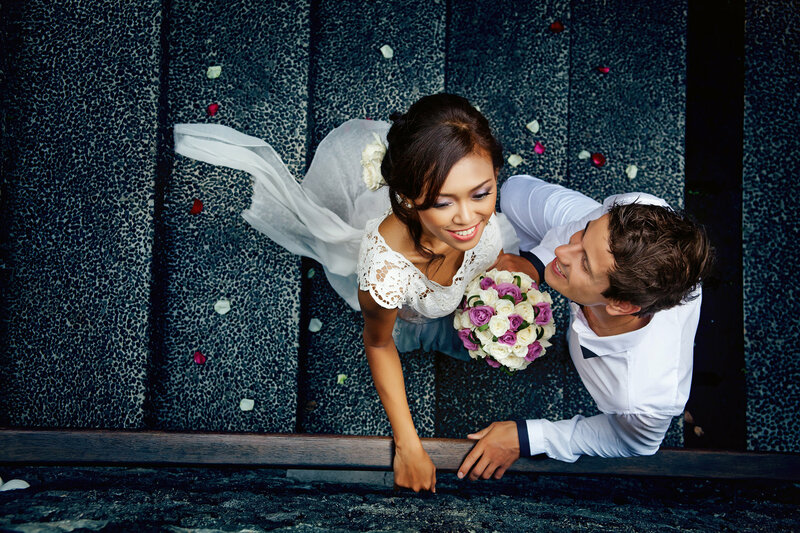 Rekindle the flames of romance with this special vacation package. Our restored 360-year-old convent is the ideal destination to celebrate anniversaries, vow renewal, special memories, or nothing at all. Stay and Discover! 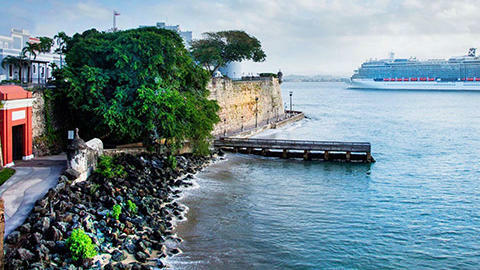 Extend your vacation at El Convento before or after your cruise and get to know the enchanting history of Old San Juan! Throughout the years, couples have chosen El Convento for a once-in-a-lifetime celebration of their destination wedding or honeymoon. Find out why. Our six modern meeting rooms are ideal for banquets, charity events, board meetings, and executive retreats. Enjoy gourmet cuisine and the latest in technology to ensure a successful meeting. Renowned as the largest Spanish fort built in the Western Hemisphere, Castillo San Cristobal is a San Juan National Historic Site. Set on over 27 acres and rising 150 feet above sea level, the fort features amazing views of the city, El Morro and the piers. Also called the Saint Christopher Castle, this amazing fortress guarded the east of Old San Juan and was instrumental in repelling the invasion of Sir Ralph Abercrombie in 1797. A classic in Old San Juan, right in the corner of San Sebastian and Cristo streets, Nono's is known for creating unforgettable moments for all its visitors. A must-visit spot to sit and enjoy a cold beer after a long day. Features high to premium quality Panama Hats in a wide range of custom styles and colors for both men and women. As well as local crafts and photographyevery visitor should take home with them. 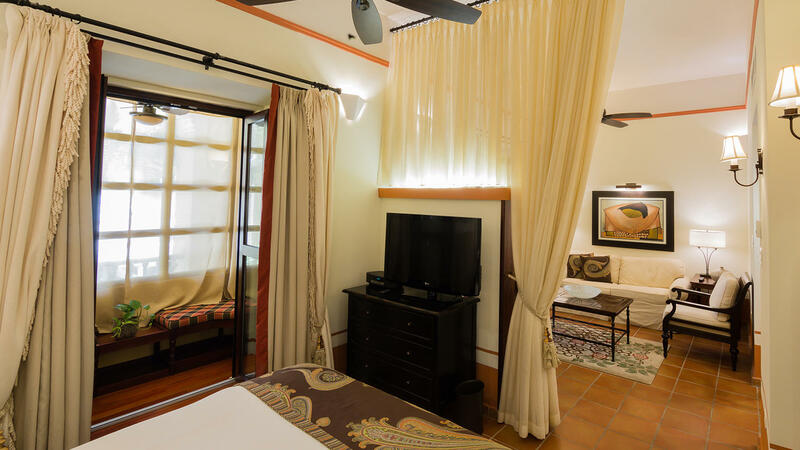 Located in the doorstep of Old San Juan, in a busy square surrounded by restaurants, cafes, and the historic Tapia Theater making it great for relaxing and people watching. Named after Christopher Columbus in 1893, a statue in his honor is the highlight of the Plaza. Like a "chinchorro" in the middle of the old city, this bar has a fun environment for the whole family, even your pets! Visit them and don't miss the astonishing views of the ocean and El Morro. Located in a 350 year old Spanish building, Galería Botello showcases some of the finest internationally recognized artists. The gallery features paintings, sculptures, ceramics and noteworthy collections of rare, antique carved santos. Extending out into San Juan Harbor, Castillo San Felipe del Morro is a 16th century military fort and World Heritage Site. This beautiful six level fort, simply known as El Morro, took more than 200 years to build and has been successful in repelling noted naval attacks by enemies, including Sir Francis Drake. During World War II, El Morro was instrumental in the US tracking the movement of German subs in the Caribbean. Intimate and exclusive rooftop located in the 3rd floor of St. Germain Bistro at Sol street. With a beautiful view of our historic buildings, enjoy the sunset and savor wine and spirits in this unique setting. One of the oldest buildings in Old San Juan, the beautiful Cathedral of San Juan Bautista is the Roman Catholic cathedral and the second oldest in the Americas. Built in 1521, the graceful cathedral features beautiful statues and relics, stained glass windows, the mummy of St. Pio and the tomb of the Spanish explorer and settlement founder Juan Ponce de León. Cathedral of San Juan is a historic landmark in the heart of the old city. Distance Outdoor Bar and Restaurant with an exquisite menu and friendly atmosphere right in front of El Totem, great after a day of walking around Old San Juan. Sit down, relax, and enjoy your drinks with a view. This very modern restaurant with cutting edge dishes is a must in Fortaleza Street. Experience the amazing wine pairings, with all the daring fresh combinations on the menu by Chef Peter Schintler. Named after the late Puerto Rican philanthropist Luis A. Ferré, the Centro de Bellas Artes Luis A. Ferré is a premier multi-use performance venue featuring three main halls for plays, operas, ballet and concerts, including legends like Plácido Domingo. Opened in 198i, the center is an important resource to the development of Puerto Rico arts and culture. Visit the center and you'll discover a wide range of art forms, workshops and education programs. Chef Franco Seccarelli's first restaurant in San Juan, is a nostalgic trip across classic Italy with its tasteful dishes and fine wine pairings, La Lanterna by Franco Seccarelli is a must stop for a relax and intimate dinner night. Possibly the best street to go shopping in Old San Juan, Calle Del Cristo is lined with designer stores, outlets, and boutiques where you can shop till you drop. 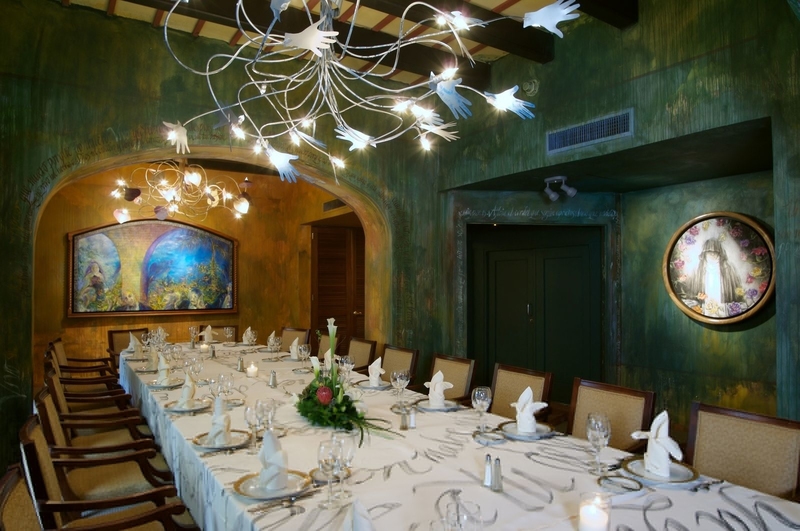 Like a small taste of Venice in Old San Juan, this romantic restaurant is ideal for date night, with its intimate ambience, modern interior and delectable dishes like la bisteca, its signature dish. An innovative gastronomic space where chocolate plays the starring role. Located in the heart of Old San Juan, the restaurant celebrates the rich history of Chocolate Cortés, a family-owned company that has been making chocolate from bean-to-bar in the Caribbean since 1929. Take a drive to the northeastern side of the Island to the only rainforest in the US – El Yunque. This lush, wild rainforest in Puerto Rico features over 28,000 acres of natural terrain, island allure and tropical splendor. Enjoy rock climbing, hiking and guided tours of the trails, like La Mina trail. Discover cascading waterfalls and clear pools for swimming. If you prefer to hike and explore the rainforest at your own pace, the trails are clearly marked for ease and enjoyment. 102 years of history in Old San Juan, this spot is part of Old San Juan's history. With its rich coffee prepared in an antique Royal cofee machine, homemade bread and pastries and the very popular Mallorca, a local favorite. Located just a few miles from Hotel El Convento, Condado Beach is considered one of the most beautiful beaches in all of Puerto Rico. Stretching along San Juan's Condado tourist district, this beautiful beach is a popular spot for basking in the sun, swimming in the sparkling blue water, and water sports like surfing, body boarding and kite surfing. Hang out on the patio of a festive beach bar by day and at night, you can take a romantic star-lit walk along the shoreline. Hotel El Convento guests have access to El Convento Beach Club, featuring beach privileges at Condado Beach. Offering creative Puerto Rican and International cuisine for over 50 years, with the best Piña Coladas which were created here by star bartender Don Ramón Portas Mingot in 1963. Located on the northeast coast of Puerto Rico, Luquillo Beach is often referred to as the sun capital of the Island. Luquillo Beach is a relaxing destination about 30 miles from Hotel El Convento with over a mile of soft glistening sand and majestic shady coconut palms. The beach is a popular tourist spot for swimming, soaking up the sunshine, snorkeling and scuba diving and offers picnic and dining areas, showers and plenty of parking. A rustic pizzeria where classic italian and international dishes are prepared with dedication with local ingredients.The classic trattoria meets colonial Old San Juan decorations make it a warm and colorful spot to enjoy lunch, dinner and of course, combine it with a selection from one of the more than 50 craft beers available at the bar. Just about an hour outside of Old San Juan, Camuy River Cave Park is the perfect day trip to explore one of the most amazing natural attractions in Puerto Rico. The third largest cave system in the world, Camuy Caves are beautifully illuminated caverns with stunning stalagmites and stalactites that make for incredible photos. Take a guided tour that includes insights from biologists and park rangers leading each group. Decorated with religious references, you will surely have a godly culinary experience wih this varied menu which offers more than just pizza, although it is still its main star. Try fresh pasta, mediterranean tapas, and vegetarian dishes in this charming flavorful site. This mixology bar is a must in Old San Juan with its speakeasy vibe and laid-back style. Located in San Sebastian street, at only steps from our hotel. Looking for Brunch? This is the place for you! Inspired in the classic french cafés, this bistro offers a variety of breads, quiches, and styled breakfasts full of creativity for the whole family. With La Fortaleza – the governor’s mansion, as a starting point, this street has a little bit for everyone. Small shops, from thrift stores to local boutiques, jewelry stores, and restaurants to finish a nice day strolling around our cobblestone streets. After a sunny afternoon in Old San Juan, nothing better than stopping for a refreshing cool treat. This local shop serves artisan gelato and sorbet popsicles in traditional in innovative flavors like Strawberry Mojito, Nutella, Peanuts, seasonal flavors like Tembleque, and traditional ones based on fruits or cream. Located minutes from the Luis Munoz Marin airport, this upscale shopping mall offers entertainment for the whole family with a notable playground, and a unique dining experience. With Nordstrom as its anchor store, it includes a wide variety of luxury brands like Louis Vuitton, Gucci, jimmy Choo, Kate Spade, Omega, Salvatore Ferragamo, Tory Burch, Versace, and more. For almost two decades, Club Jibarito has set the standards of luxury retail in Puerto Rico and the Caribbean, offering a wid array of Elite jewelry and watch brands. Neighborhood market turned bar, this whimsical hidden gem captures Old San Juan's nightlife keeping its old school rustic cuban spirit. Fresh ingredients and homemade bitters for one of a kind cocktails. A women's clothing store with a design that reflects both classic and modern accents with the decoration, that goes simply perfect with the collections available. Explore incredible attractions and historic sites, including San Juan Cathedral and the Museum of Art of Puerto Rico. Lounge on the sands of Condado Beach or experience the natural beauty of El Yunque rainforest.